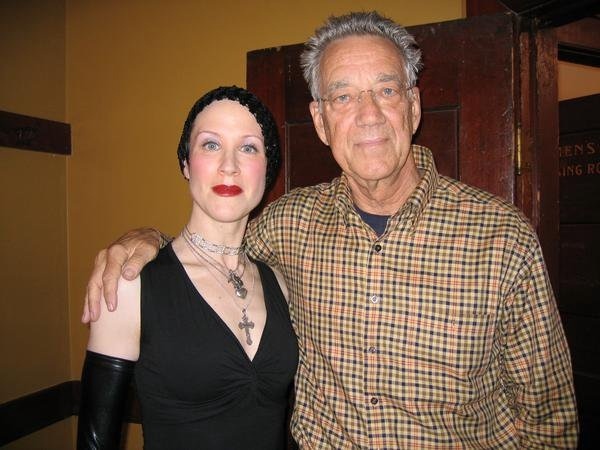 For over a decade, it has been my great honor and adventure to be your “Belle of the Ball.” The glam Gorey weekend has become San Francisco’s beloved and elaborate January tradition. For Edwardian Ball 2014, I make a triumphant return to one of my favorite locales of all time—you may know it without realizing— It’s the grand red room immortalized in my music video “Haunted By the Thought of You.” But best of all— for the VERY FIRST TIME, I’m inviting the audience to the THIRD FLOOR…transforming the historical Masonic Lodge into The Parlour of Spirits! The Freemasons held their secret ceremonies and rituals in this very room, now it’s our turn to conjure some magic together. Join me Saturday night Jan 18 at 9:30pm with special guest Spirits: Drummer Randy Odell, Bassist Kenny Annis, vionlinist/theremin player Meredith Yayanos (The Parlour Trick) plus exclusive spectres and spectacles by Shadow Circus Productions! 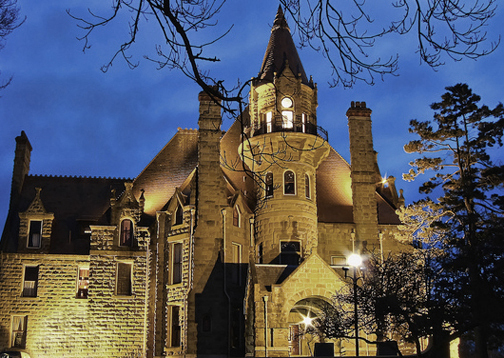 When I chose a location for “Haunted by the Thought of You,” I wanted a space that had a haunted past, replete with a secret history, symbology and magnificent architecture, so I could really make the song come to life. 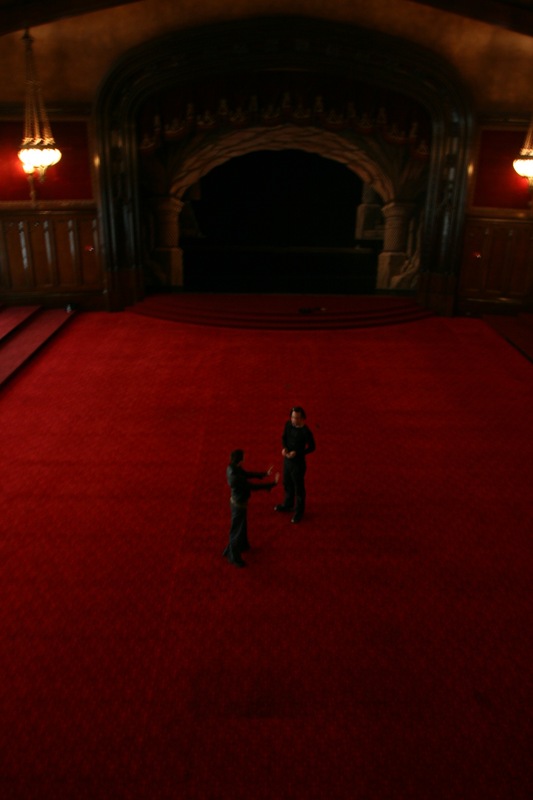 This was before the Edwardian Ball regularly used the Lodge Level, so I had only been in the room a couple of times…always alone…always quiet, it seemed to beckon me with its vastness… its hidden tales. My first meeting in the Lodge with music video director Terran Schackor. From it’s inception, California was a haven for Freemasons. Many of the states pioneers— Fremont, Stevenson, O’Farrell and Montgomery were Masons. The Regency Center (at the corner of Van Ness and Sutter) was built in 1906 by and for the Scottish Rite Masons. It had nothing to do with the Regency Hotel. The building is historic, grand, full of strange crawlspaces and mysterious tiny rooms. Transported by a century-old gilded elevator, the third floor Lodge is its gem —with velvet red walls, dark mahogany woodwork, 30 foot-high vaulted ceilings dripping with art nouveau chandeliers., and a grand stage shrouded by an spectacularly tasseled curtain. A giant pipe organ lurks at one end, a stage with 32 vintage backdrops corresponding to the Masonic levels at the other. Secret passageways and trap doors hide amongst the woodwork. Everywhere I looked was a perfect shot. Perfect colors. Intoxicating. I got chills. Back in a secret room by the 1909 Austin pipe organ, is the fabled trapdoor, in which inductees were blindfolded & then lowered down to perform their induction rites. There are secret passageways to the organ loft, where “trust rituals” took place. Legend has it a rope went around a would-be mason’s neck and he jumped through the trapdoor trusting that his cloaked brothers would catch him in time. But did they all make it? High above the ornate theatre stage is a catwalk that provides access to old rope pulleys that raise and lower 32 lavish hand-painted backdrops. 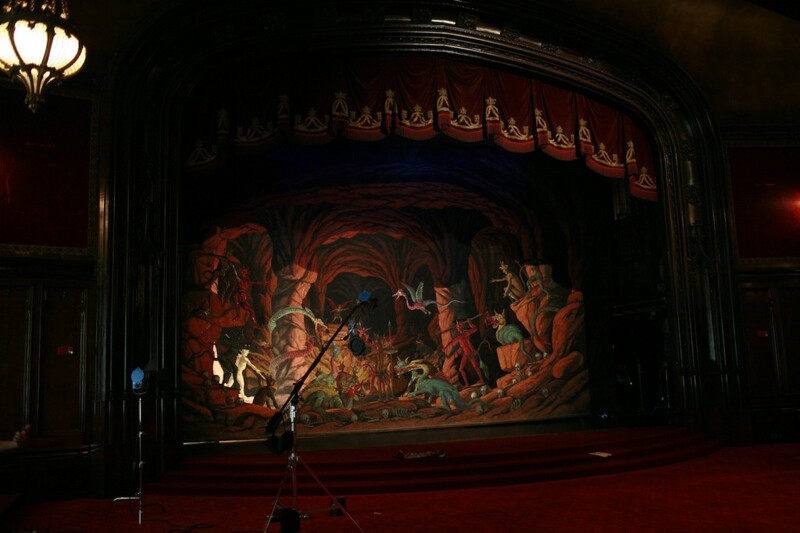 Painted in the 1920s, the backdrops are huge, priceless objects of art that depict scenes that dramatized the Mason’s secret rituals. Backstage I could see old penciled notations, now barely legible, posted on the walls. 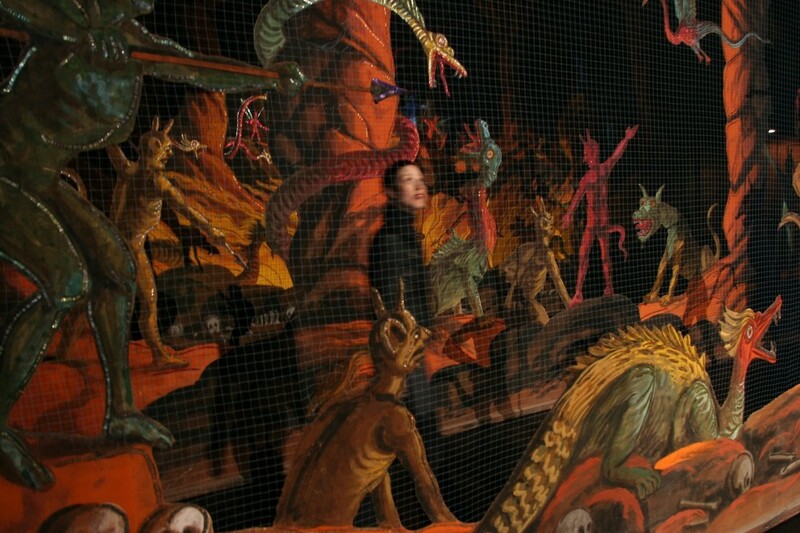 Inside the 3D Hades backdrop in bright light. You can see the delicate gridwork that holds them together. These were painted in the 1920s. The 32 settings depict everything from ancient Rome, Egypt, to Medieval Europe, pastoral scenes, forests, and decorative columns. 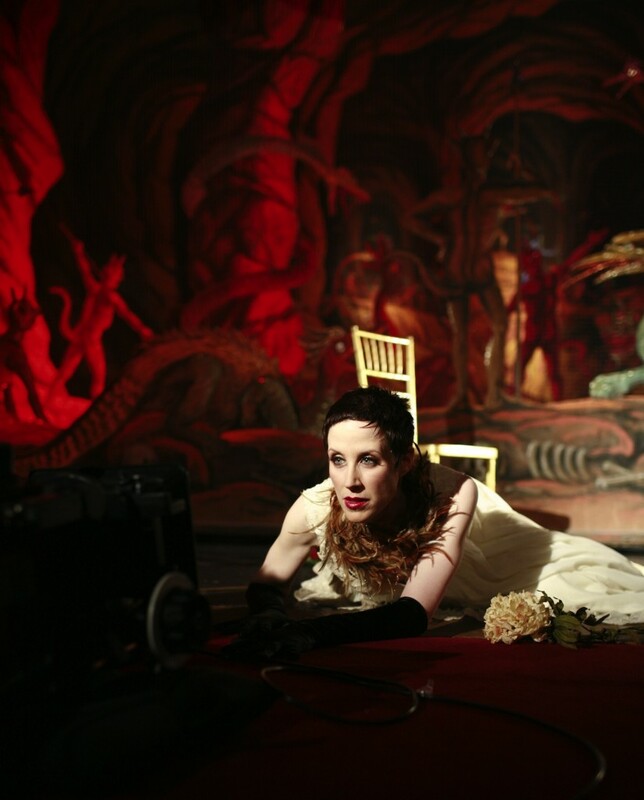 Naturally for the “Haunted by the Thought of You” video, I chose the Hades backdrop with its strange crimson imps, devils, fantastical winged creatures and sinister caverns. Ahhh, the torment of obsession and longing is hellish indeed. Setting the Hades backdrop and lighting the scene. At last. Hades in proper lighting. The stage is set! Note the gorgeous red velvet curtains and chandeliers. The Freemasons use of this theatre and elaborate backdrops were to perform one-act teaching plays called Degrees of the Scottish Rite. They were often staged with costume, special effects, and the full rigging of any professional production. Their purpose was to examine different philosophies, ancient religions, and systems of ethics— honoring theatre as one of the principal means of instruction throughout history. Me immersed in perfectly lit Hades. Magnificent. Cinematographer Mike Duffy captures me amidst the great mahogany walls and 30-foot vaulted ceiling. There is Masonic symbolism all through the building—and all through the city of San Francisco. There are controversial theories that Market, Van Ness, Columbus and Montgomery were actually designed as a unique talisman— an alignment creating a Masonic Pyramid incorporated into the city’s grid at the earliest days of its history and appears to have been marked periodically with the construction of additional symbolic and related buildings in relationship to Masonic numerology. Freemasons revere the numbers 3, 11, 13, 33 among others. You will find countless examples of it not only in the Lodge, but in the city of San Francisco. In honor of this numerical magic, (and my OWN obsession with the number 3) the clock in the “Haunted by the Thought of You” music video spins and stops on 3:33. (Thanks to the brilliant special FX of Dave from Shadow Circus Productions.) You’ll find other hidden numerical references within the video as well. Not surprisingly, the Masonic Center stands at 1111 California Street. The rampant symbolism is fascinating and merits a complete blog in itself— I recommend reading Stephen Vincent O’Rourke’s “San Francisco Pyramid Saga.” You’ll never look at San Francisco the same way again. Of course the Masonic Lodge would be on the magical 3rd floor. But during location scouting, I discovered a secret: There is an unused and little-known 4th floor in the building!! What’s up there? My imagination soars. I’d like to note that the heyday of this 1909 Masonic Lodge coincides the with peak era in the spiritualism movement. It was certainly a time of believing in magic, mystery, ghosts, and otherworldly communication. A time of wonderment and marvel— that is sadly lacking today. 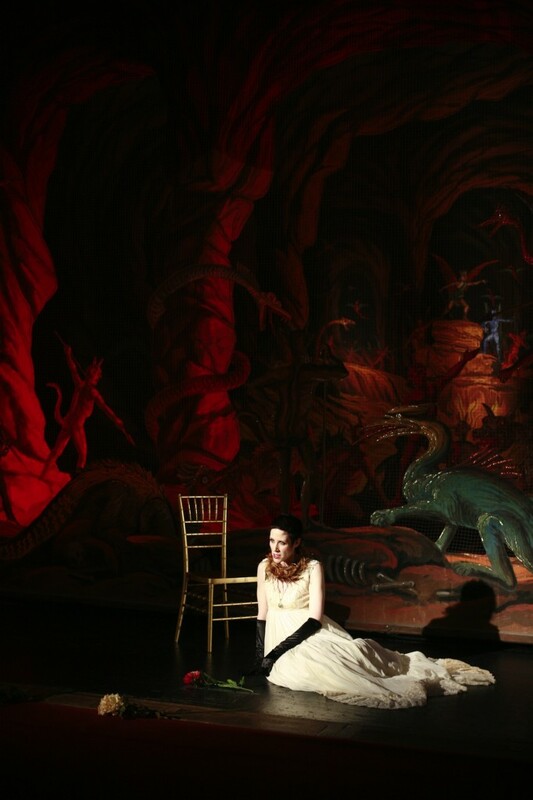 One of the best things about The Edwardian Ball is the ability to reclaim that spirit—The Ball remains a brave testament to authenticity––being anything you wish to be, honoring your passions brazenly and unapologetically. 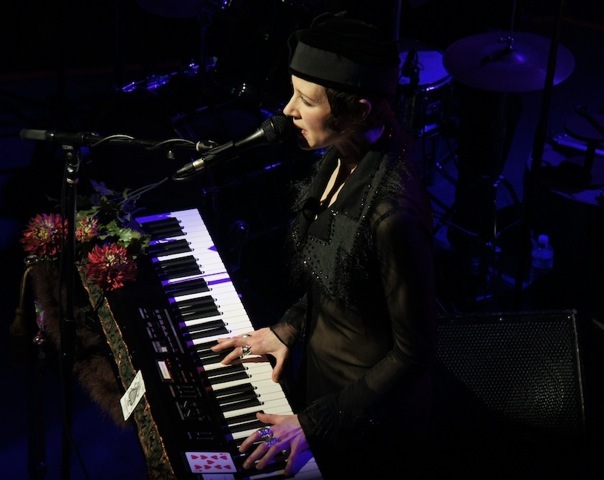 “Haunted by the Thought of You is on the Jill Tracy album The Bittersweet Constrain. Visit Jill Tracy’s official website HERE. 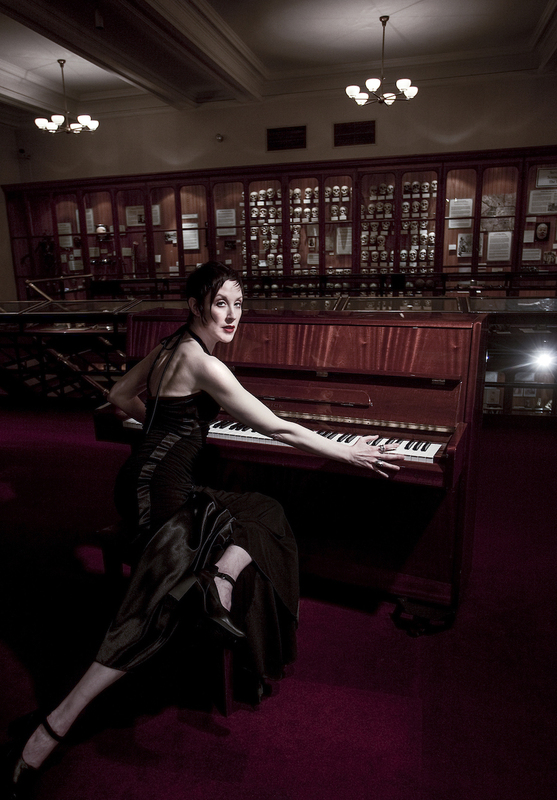 Get your tickets for The Edwardian Ball! Well that’s just it. It was never about the piano. I was merely looking for a time machine, a portal, escape hatch, a way out of this dreary place. Discovery of classic film score composers and bands like Pink Floyd and The Doors transported me. It was the music itself that conjured the emotion. It was inside our own heads. I wanted to figure out how to do the same thing–– create imaginary worlds of my own. Please read this wonderful interview in Sepiachord where I discuss this in depth. 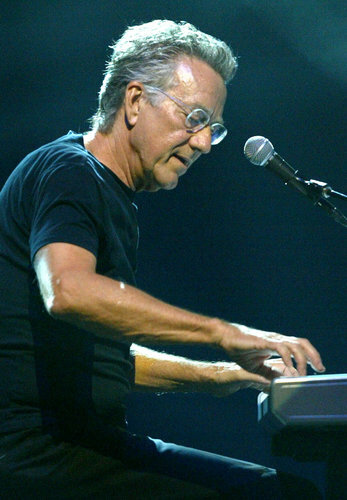 I am so saddened to hear of the passing of The Door’s brilliant keyboard player Ray Manzarek. At a time when I was forced to take stale piano lessons (which thankfully I eventually quit) and hated the instrument, I discovered a song that changed everything. “Riders on the Storm” was one of the first songs that inspired me to compose my own music. It was one of the first songs I easily picked out by ear as a girl and began playing its hypnotic riff––it was positively mystical. I found then I could not only play by ear, but also the excitement of exploring unusual keys and improvisations. (As most of you know, to this day I don’t read or write music. It’s all intuited.) I realized it was all about breaking the rules, or at least inventing your own. This informed all of my later work. 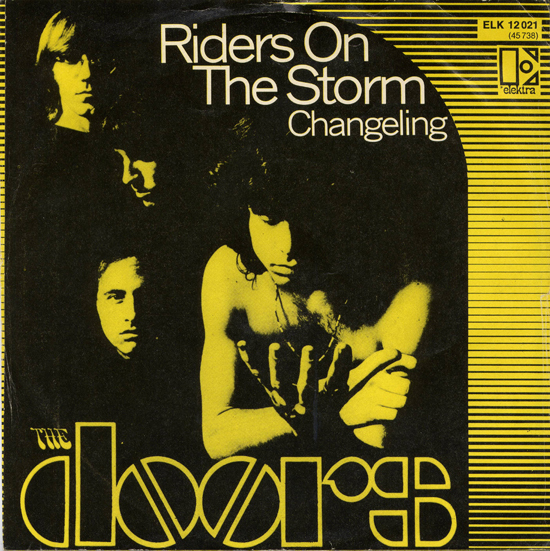 “Riders on the Storm” (from The Doors 1971 album, L.A. Woman) is played in E Dorian mode, and featured its trademark sound effects of a dreamy thunderstorm amidst Ray Manzarek’s Fender Rhodes electric piano, which also emulates the soft sound of rain. It was a fragile, transparent piece––haunted, meditative, suspenseful, subtle, carnival-esque. As a kid, I would play “Riders on the Storm,” over and over again, get lost inside those gorgeous cascading notes. It was almost like casting a spell, or unlocking some mysterious code. I felt like if I just got all the notes right, the world would suddenly make sense. Maybe it wouldn’t be so bad after all. That power I realized I had hidden inside me all along. Finding the key to unlock it is the trick. In my case it was E Dorian Mode. Onstage, The Doors’ four-man lineup was distinctive; it did not include a bass player. Manzarek’s powerful left hand held down the bass grooves on the keys. 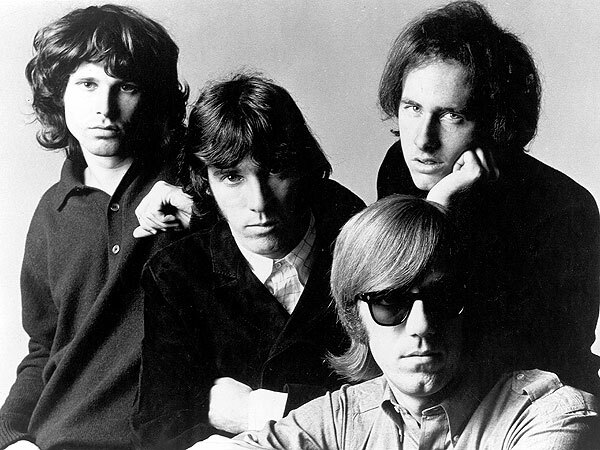 (The rest of The Doors: drummer John Densmore, guitarist Robby Krieger and of course, singer Jim Morrison.) This fact was always quite comforting to me during times I did not have a bassist. I must say growing up loving 1970s rock made me develop my own strong left hand. With my music, a heavy seductive bass line is crucial, especially when I am playing solo. Little did I know, years later I would actually share the stage with Ray Manzarek. We were two of the musicians chosen by Litquake to speak about our favorite books, play music, and discuss how literature has influenced our work. Ray and I had neighboring dressing rooms. He told me funny stories. I told him he was partly responsible for me becoming a pianist…told him my tale of discovering “Riders on the Storm” and he said he was honored. Ray looked at me. I smiled. He began playing “Riders on the Storm.” Time stopped. I suddenly became that 8 year old girl again…and fought to hide the tears in my eyes. I will never forget that moment. Into this world we’re thrown. Thank you Ray. For your music, your inspiration and for being kind to a young pianist who didn’t want you to know you had moved her to tears. You still do. You remain always in spirit. I guess it’s a good sign when 2012 begins with such a flurry of dream projects, that I have had no time to devote to a year-end review until now. 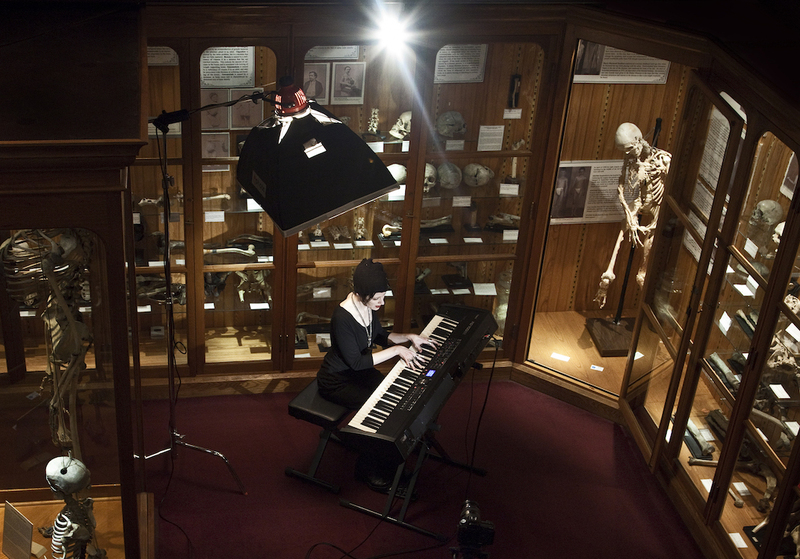 Stay tuned for news about my upcoming 2012 collaboration with Philadelphia’s legendary Mutter Museum and new recording for Swedish publishers Malört alongside Einstürzende Neubauten. Visit the NEWS page to get the latest updates. 2011 was such a tough, challenging, but charmed year–this new website did not go live until September—so I wanted to make sure to feature the highlights for you here. 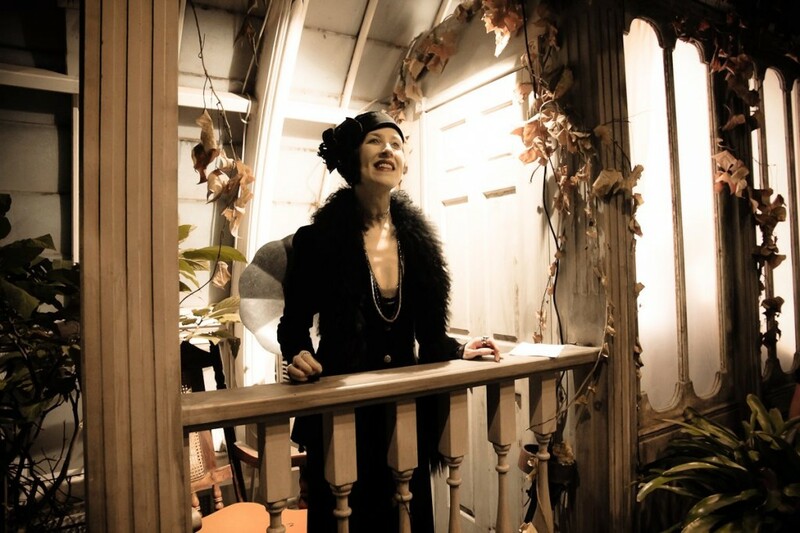 Of course, January means the famed Edwardian Ball, clearly the most lavish and fantastical event of the year–a costumed spectacle in honor of the late great raccoon-coated scribe Edward Gorey. 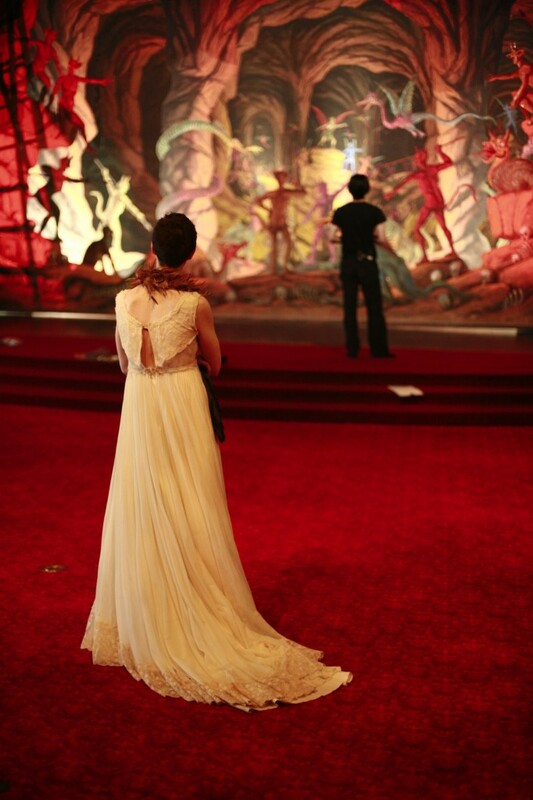 For the last decade, I have had the honor to be hailed “Belle of the Ball” and perform in concert each year. 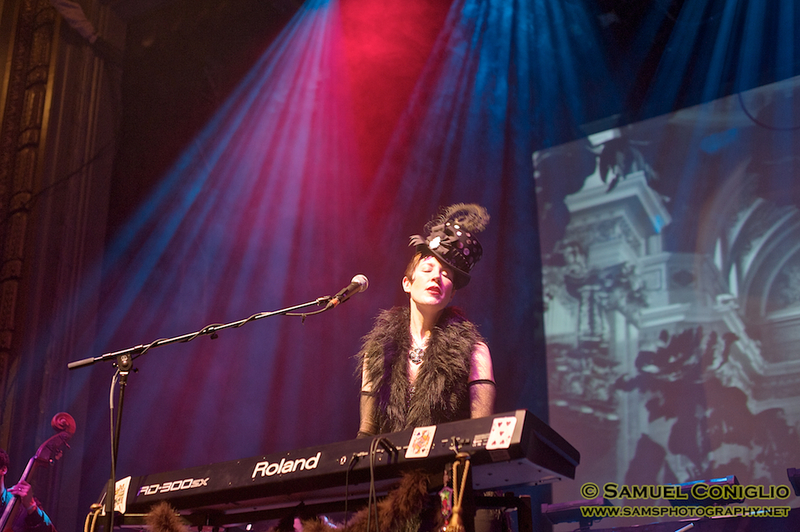 The above photo is my favorite 2011 Edwardian Ball shot by Samuel Coniglio. Custom adorned top hat by the marvelous House of Nines Design. At the Los Angeles Ball, I welcomed special guests: renowned theremin player Armen Ra ( fresh from the Grinderman tour) and Coilhouse mastermind/ Parlour Trick violinist Meredith Yayanos. I released “Under the Fate of the Blue Moon,” a waltz to make wishes come true–a dreamily enchanting piece I composed on the rare Blue Moon New Year and recorded the night of the total Lunar Eclipse Solstice Dec 20, 2010. I released the work as a free download. It’s my online wishing well. Make a wish, leave an offering. BENEATH: The Bittersweet Constrain was a glorious accidental release. After several Hollywood music supervisors asked me for an instrumental version of “Haunted by the Thought of You,” I met with producer Alex Nahas in New York City to remix the tune. We both became more and more intrigued, as the absence of vocals invited many of the previously unused or little-heard tracks: strings, woodwinds, Chapman Stick, sarod, harmonium and others. I’m thrilled when people tell me they write or work to my music, and this is certainly a perfect soundscape, a dark, gorgeous portal. Brilliant cover shot by Michael Garlington. In February, I joined host Chloe Veltman live on KALW, San Francisco public radio/NPR affiliate 91.7 FM as guest of the hour-long “Voice Box” program. 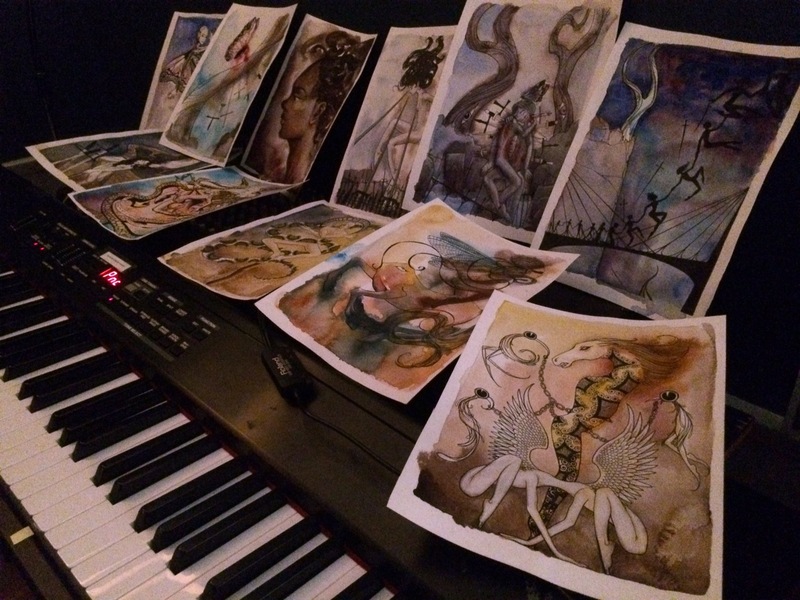 The theme of the show was “singers who accompany themselves on the piano,” and it gave me a wonderful chance to discuss the variations, challenges– and funny stories that come with the territory. Listen to an archive of the show online HERE. 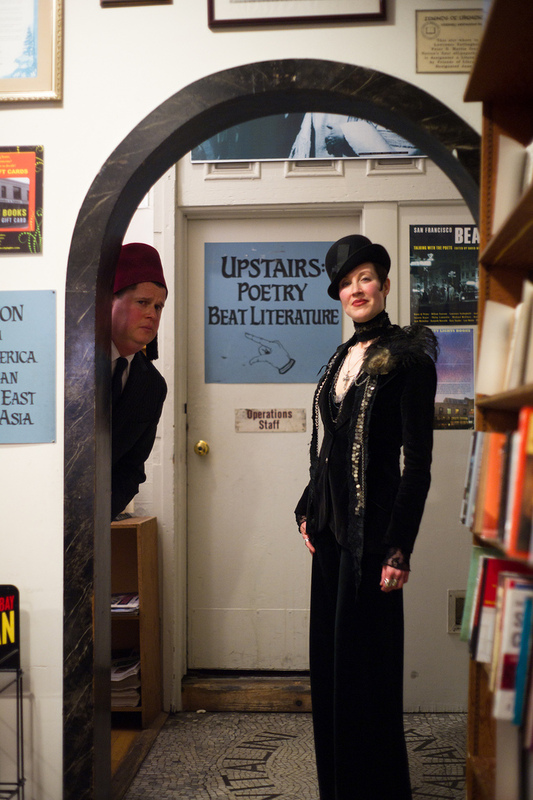 San Francisco mobbed famed City Lights Books for my murderous musical set with none other than the infamous Lemony Snicket himself (aka Daniel Handler) on accordion. This photo was taken by Audrey Penven post-show. You best know Oakland filmmaker Bill Domonkos by our beloved award-winning short “The Fine Art of Poisoning,” and his collection of acclaimed videos for legendary masked band The Residents. I had the great opportunity to again collaborate on his latest– the surreal, sci-fi suspense NERVOUS96. Bill painstakingly crafted excerpts from my Musical Seance sessions with Atlanta violinist Paul Mercer, and our channeled music becomes the emotional dialogue for the entire film. It’s stunning. 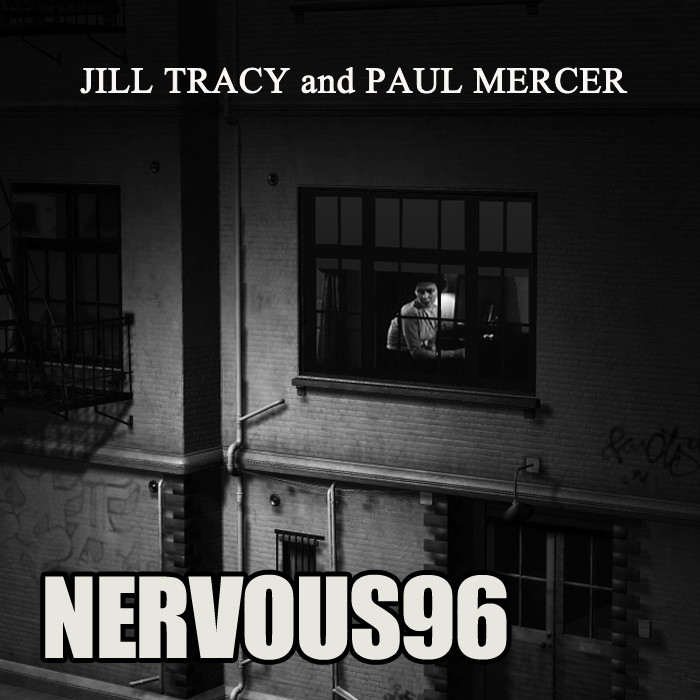 The NERVOUS96 musical score is available for download on Bandcamp! New York Times best-selling author Melissa Marr named “Sell My Soul“ as the official song for her novel Graveminder. 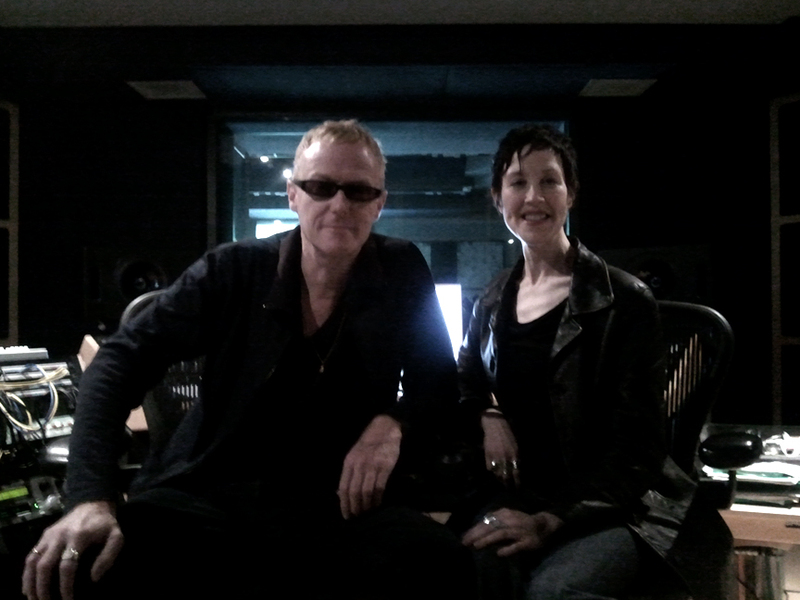 Marr says she listened to the tune on endless repeat for inspiration, especially while creating scenes in the Land of the Dead. I will be forever immortalized as the sultry singer in Mr. D’s Tip Top Tavern, alluring nightspot of the unliving. Marr also listed “Haunted by the Thought of You” in the playlist for her “Wicked Lovely” series. My music is also on the official playlist for Cat Winter’s In the Shadow of Blackbirds, a YA novel centering around Victorian spiritualism. I was a celebrity speller for Small Press Distribution‘s annual Bee In, hosted by West Coast Live’s Sedge Thompson. I went down on the word “abscess” befittingly enough. It’s always the tricky little words that get you. 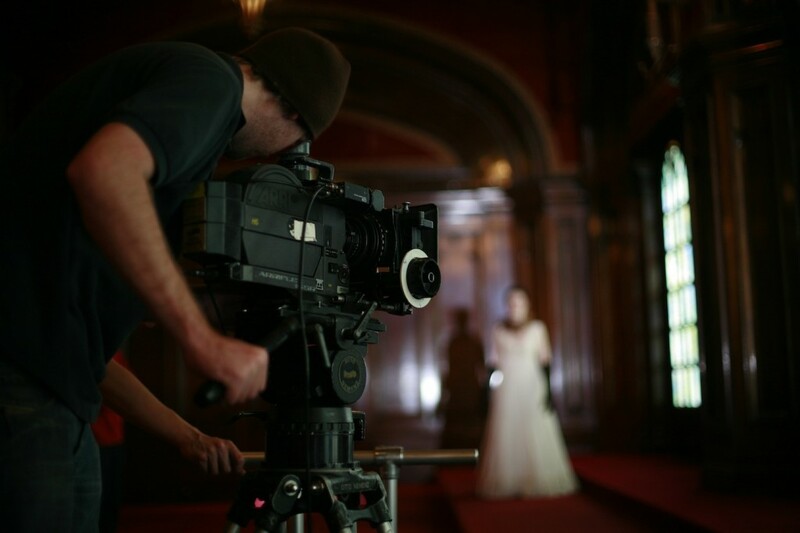 A wondrous shot of me with David J, shooting green screen on the set of the music video of the David J. +Shok collaboration “Tidal Wave of Blood.” I sing back-up vocals. My favorite photoshoot of the year by far was one done with next to no prep, stealth, late at night, sneaking into the dark, ornate stairwell of a downtown office building. Photographer Audrey Penven and I wanted to play with shadow. I loved the idea of incorporating lace textures, perhaps shoot through lace. She had the incredible idea to project actual lace onto the entire shot. The way these photos were achieved is innovative and fascinating. Please read the tale of the making of “In Lace Shadows.“ There are many more shots there too, plus a link to the full gallery. One of Audrey’s Lace Shadows portraits became the landing page for my new website which I was ecstatic to finally launch in 2011!! The site backgrounds were created by visual FX artist and friend Robert Rossello. (You remember his gorgeous artwork for Diabolical Streak!) We collected and created imagery–all from my personal collection– Even the textures like feathers, fur, old medical perscriptions, antique charts of constellations, opium poppies, apothecary bottles, my talismans– were all individually crafted. Thank you so much to Rob and Sue Trowbridge for their hard work, ingenuity, and support. Read the backstory on the inspiration behind the new website. And plans are underway for several features, including Cabinet 45, my artists collaborative shoppe. 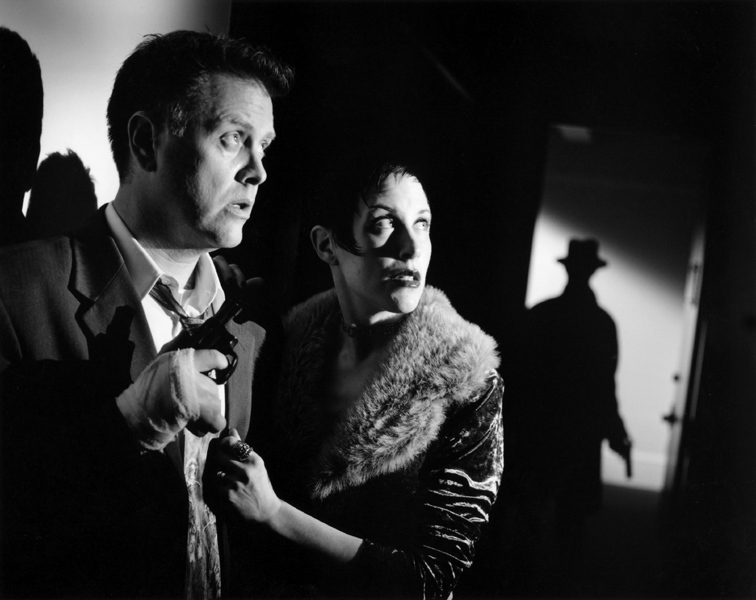 2011 was my first year officially working with the San Francisco Silent Film Festival. I did a myriad of things–from scoring several film shorts and performing live for their press conference, to moderating the panel “Variations on a Theme,” discussing the craft of scoring silent films with some of the best in the business. The photo above by San Francisco’s Examiner’s Omar Moore shows me introducing F. W. Murnau’s epic Sunrise. The dark side of the Garden came to deadly bloom in October at the historical San Francisco Conservatory of Flowers as I teamed up with Wicked Plants author Amy Stewart and produced a perilous event within the exhibit. We called it appropriately enough “The Fine Art of Poisoning: Perils, Pleasures and Protocols.” The beautiful white glass Victorian dome is a sight to behold in the dark, so I wanted to give the public a chance to explore it at night, under my guise. 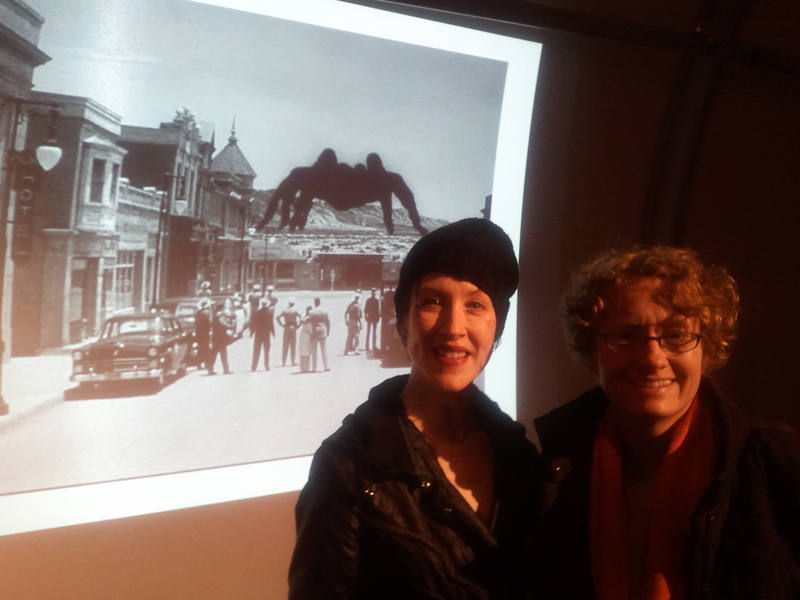 After hours in the Conservatory of Flowers with Wicked Plants author Amy Stewart and a giant tarantula. This event was such a success that the Conservatory and I are in meetings to create an ongoing night series together! 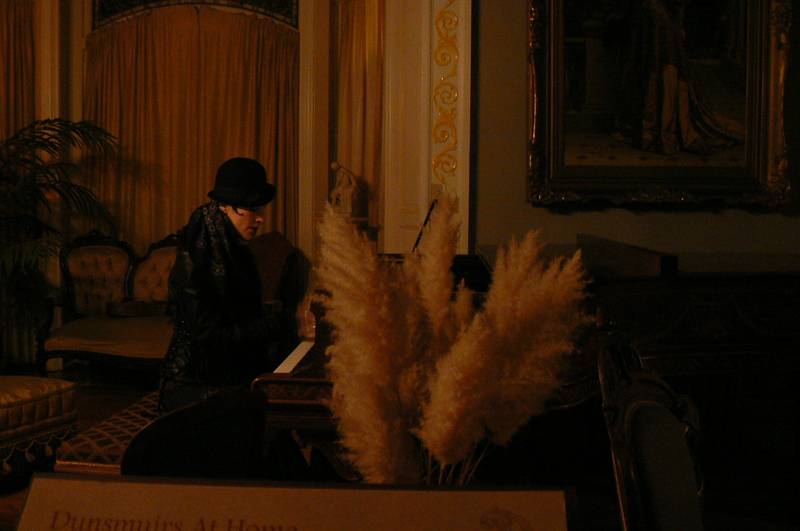 When producer/writer/filmmaker Jordan Stratford invited me to perform at Victoria British Columbia’s Craigdarroch Castle as part of his great Victoria Steam Expo, it fulfilled a wish I made when I first visited. This was an ideal location for my “spontaneous musical combustion”– composing works on the spot in front of the audience, manifesting the musical spirit within the location itself. Every place has a story, every object holds music. My job is to be the gatekeeper, and open the portal. Nothing on Craigdarroch Castle’s official website will tell you it’s haunted. The 1890 treasure is simply hailed “Victoria, British Columbia’s legendary landmark.” It’s when you begin talking to the locals– and even people who work within its lavish walls– that you begin to hear secret tales of its 39 rooms, 87 steps, 4 floors, 18 fireplaces, tower, and tormented past. I wanted to immerse myself within its surrounding and bring it to life. 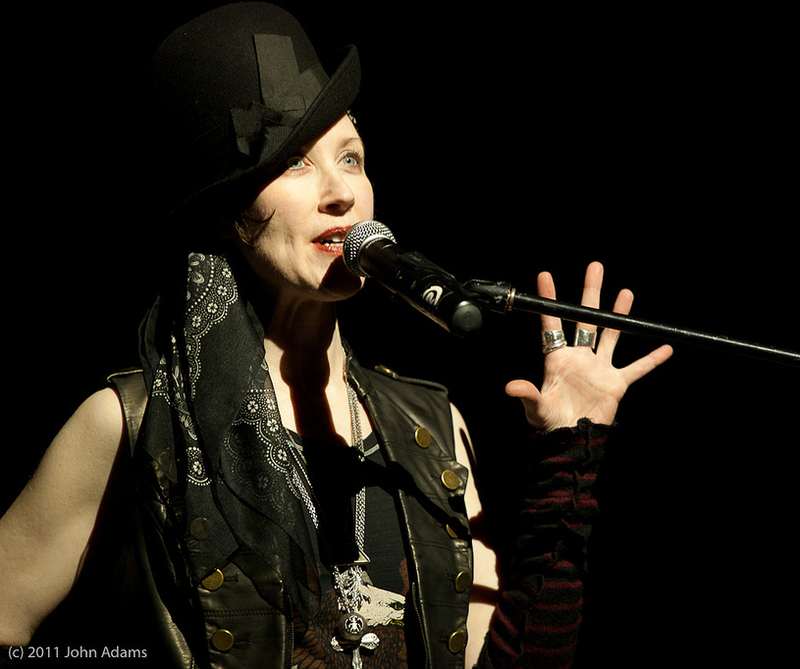 There were many memorable shows in 2011, including a double bill and collaboration onstage with Tuvan throat singer Soriah. In this photo by John Adams, I’m speaking to the crowd at a moving benefit for friend and fellow performer kSea Flux. 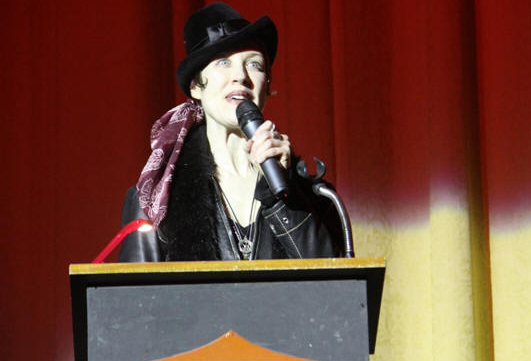 Sacramento Horror Film Festival presented an evening called “The Elegant Dark with Jill Tracy,” where I not only performed a concert, but shared my stories, short films, and Q&A with the audience. I was really inspired by the opportunity to present my various passions and mediums all together, and plan to do more full sensory shows like this. I was honored to pen the forward for Maria Alexander’s decadent and deadly collection of absinthe-inspired verse At Louche Ends (Burning Effigy Press) recalling my days performing in the then-illegal emerald underworld. NYC artist Katelan Foisy’s gorgeous painting adorns the cover. An intoxicating dose of words and visuals from three powerful women. NPR’s beloved long-running radio show Hearts of Space devoted an entire program to my music to celebrate the October season. Haunted– a Jill Tracy Conjuration aired on over 200 NPR stations, celebrating my instrumentals, film score work, and haunting, ambient songs. I was astonished and delighted as they rarely devote an entire show to one artist. Thank you Stephen Hill and everyone at HOS! They tell me the show got a tremendous response. Click on the link to hear the archive. It’s Program 961. “We consider Jill Tracy a Bay Area treasure…like Grafeo coffee, Scharffen Berger chocolates, and fine Napa Cabernets. 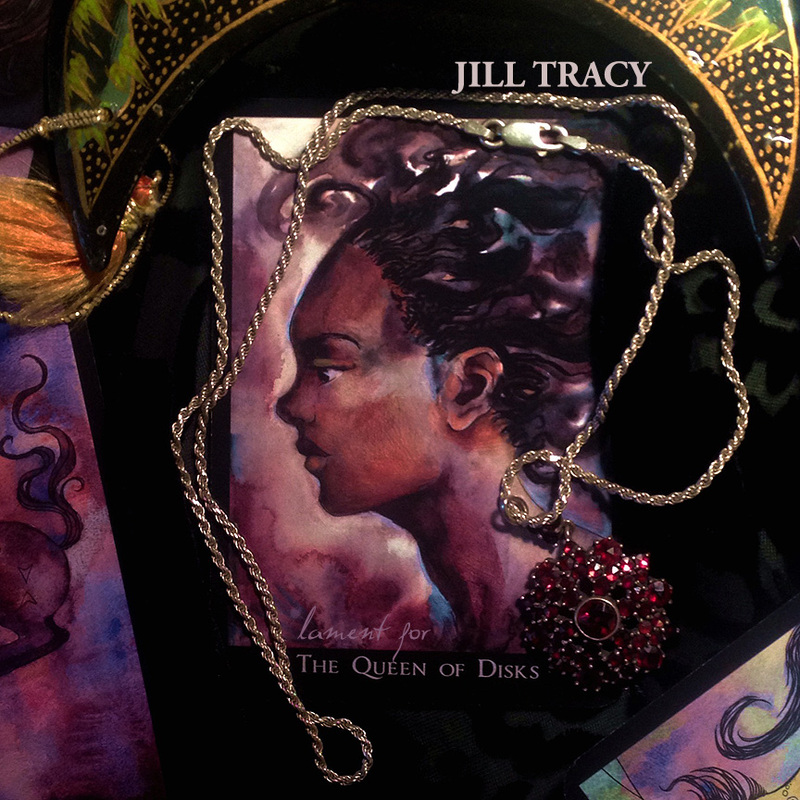 As a lyricist and songwriter, Jill Tracy plies the literary currents popularized by Edgar Allen Poe, Bram Stoker, Edward Gorey and other 19th and 20th century storytellers of the netherworld: spinners of tales of the mysterious, the strange, and the macabre. Here’s to a magical 2012. I’m glad you’re along for the ride.